In our previous article we reviewed four of the most loaded laptops around the $500 tag. We have lowered it further to $400 to see what the market segmentation is like at that price point. The point of high end laptops was to provide performance and we cared little about weight and battery life. Surely, at this budget if we are not asking for gaming, we can get good laptops for lightweight productivity and casual use. Can’t We? Well the market is segmented differently from the perspective of a few manufacturers. Somehow, they want to convince consumers that at $400 they can provide everything just as well as those high end products. As a result, we end up with products that aren’t good for power users or the casual ones. These are the products which you would want to avoid. Also considering your personal needs is important while deciding what you might prefer. For example, if you are a blogger who likes to travel to different places and write about them then reliable battery performance is going to matter more than CPU performance or the RAM size. Similarly, a corporate executive can appreciate a faster SSD which would make boot time extremely small and programs like Microsoft Office would load quickly. Notice that we are considering products that can be regarded as laptops and are not convertible tablets or Chromebooks. The main reason for doing this is not so much the form factor but the CPU inside it. Anything with an Intel Core M from any generation is something we are intentionally avoiding just to stick to laptop department alone. There is an entire range of Macbooks and Microsoft Surface Pro and Surface Book, but those things cost north of a $1000 price tag. Something a budget conscious person would avoid. Yet there is some hope, with the right balance between low powered CPU, a snappy little SSD and decent peripheral connectivity laptops at this price point may just be worth it. Also they tend to have a better battery life what with the lack of power hungry processor and GPU. These will be the deciding parameters in our evaluation. Let’s dive in and look at some of the most popular laptops around 400$ on Amazon. Coming packed with many attractive features and an appealing design and look, this laptop is an ideal choice for everyday users. Talking about the design, the Acer Aspire E5-576-392H is not a baby care requirement laptop in this price segment. It looks substantial with a huge number of ports, its note-worthy heavyweight build and of course the monitor hinge. The WiFi is an 802.11ac and this laptop consists of 3 USB 3.0 ports, an HDMI port and also a physical Ethernet port. Its matte plastic gives this Acer Aspire laptop that brushed look which is indeed a brownie point in terms of style! Coming to the performance, it houses an 8th gen Core i3 2.2 GHz CPU along with 6 Gigabytes of ram. Though not ideal for gaming as such, this configuration is enough to swiftly handle day to day tasks such as video streaming, web browsing and so on. Streaming multiple HD videos did not give any trouble which came as a surprise with the specs it housed. This fact was yet another brownie point to its list. 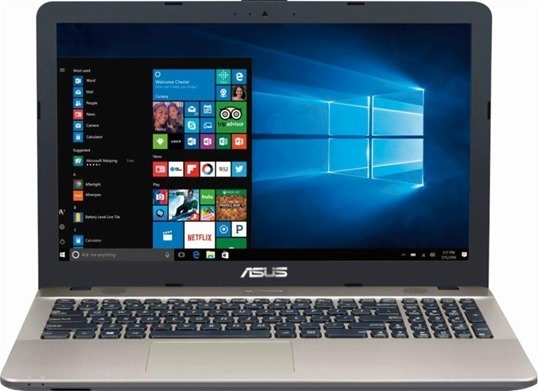 It comes bundled with Windows 10 which is the preferred choice for most of the individuals. The support for various hardware and software and the flexibility of the OS to work with makes window 10 quite popular among all the PC users. So again, regarding the software aspect no complaints with the Acer Aspire E5-576-392H. When it comes to display, this is where things go a little bit out of hands. The large bezel and washed out colours are what gives this laptop a major drawback. The viewing angles are poor and the visibility under daylight conditions is below average. The overall display performance of the laptop is well below an average user’s requirements. There is no touchscreen on this laptop, pretty much expected in this price range but the keyboards and trackpad performed above expectations. Hence, the interface category favoured the Acer Aspire. Now the battery capacity is pretty much commendable. This laptop scores the highest in this category with its high end battery which could easily last for about 11 to 12 hours. (Acer claimed a battery life of about 13.5 hours) It could easily get us through all our day to day activities unlike other high spec laptops which struggled to last through even 2 to 3 movies. No complaints on this aspect and if you are someone who is looking for a solid battery life, then this should indeed be on your consideration list! With an incredible performance for our daily tasks and a splendid battery life, the ACER Aspire E5-576-392H is worth considering for normal users. The Turbo boost technology 2.0 can give you that extra juice to carry out your regular tasks with ease. 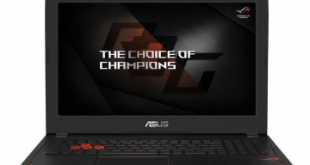 If you are not a gamer, can enjoy some good hardware with incredible battery life at the cost of the display performance, then this laptop right here, will not disappoint you in any manner. That said, this laptop is one solid casual user laptop! Probably denoting as maximum saving, the Asus Vivobook “max” is the right choice for getting all the jobs done by spending a limited amount. 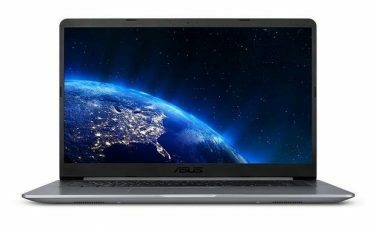 Users looking for a cheap option for a 15.6-inch laptop that can carry out your basic needs with ease, should take a look at the ASUS Vivobook Max. The price of this laptop is one of the cheapest among all other alternatives. You simply cannot expect for many features to be showcased by this device but the hard drive capacity is worth the mention at this price. The design and build look metallic from a distance but it is all plastic. The keyboard surround also flexes at times which can bring discomfort to the typing feel. The laptop build quality is below average and is not ideal for carrying alongside for long journeys. It is more suited for Home and Office works. It houses a DVD Multi-writer, USB ports, VGA and HDMI outputs and also an Ethernet port. The trackpad’s clicker is kind of stiff at times and the performance is just average. The viewing angle on this laptop is disastrous when compared to IPS displays as this laptop consists of a TN display. TN displays are outdated and Asus could have included an IPS display in this machine. The performance of this laptop is acceptable to a certain extent but not the satisfaction one would be expecting from a brand like Asus. It houses a Pentium N4200 processor which falls far behind when compared with the i3 series even. Windows 10 just manages to perform at an average level and it is very well known to what extent the activities could be carried out. Do not even bother playing games using this rig as that question is simply out of the context. The sound quality came as a surprise as it was quite amazing for this price segment. Finally, something that the Asus Vivobook could be proud of! The battery life was poor giving roughly about 4 hours which was just like any other typical below average laptops. On a tight budget, yes, the Vivobook does look like a viable option but still not up to the mark for daily use. If you are a regular laptop user, you might better off be with an i3 processor rather than a Pentium. The display is pretty bad and the fake metal finish does not contribute much to its beauty too. The only joy you might find from this rig would be regarding the hard drive capacity and sound quality. Nevertheless, a solid performer when NOT used on a regular basis! The HP 15-bw07ax is a power horse that brings the latest powerful APU from AMD, the A12-9720P to the market. This is the big brother of its predecessor, the HP-15 (A9). The chassis gets downgraded from the silver plastic shell to black and textured finish which looks cheaper. The display is of a 15.6 inch diagonal HD touchscreen SVA Brightview WLED backlit. The resolution is of 1366* 768. The contrast ratio is a solid 752:1 and the screen also had a good response time. The display, however, had slight issues with colour accuracy and colour reproduction. Also, the viewing angles were poor and almost as same as the lower level laptops of HP which was disappointing. Housed with a processor is an AMD A12-9720P Quad core chipset with a base frequency of 2.7 GHz and burst frequency of 3.8 GHz with 2MB cache. The Radeon R7 graphics did give the APU an edge over integrated GPUs of Intel. Even though this laptop did outperform many budget laptops in this category it still falls behind the core i3 and i5 powered rigs. It consists of an 8 GB DDR4-1866 SDRAM which should let you do all basic multitasking activities in a breeze. The gaming performance was decent, not that solid enough. Older titles ran well in low to medium settings at higher resolutions but new titles did experience bad frame drops which rendered it unplayable. There is an island style numeric keypad and a multi-touch gesture support touchpad. The HP-bw07ax consists of 1 USB 3.0 port, 2 USB 2.0 port, 1 HDMI port, 1 RJ-45 and a headphone/microphone combo port. It comes along with a wireless mouse and preloaded with Windows 10 OS. The hard disk capacity is of 1 TB which is enough space to store your files, movies and games. The only problem with the hard disk is that it runs at 5200 RPM which is as slow as it can get on any other laptop. The HP 15-bw07ax is a decent performer in this budget but it does have some stability issues. The APU is top class in theory but falls short a bit practically. Overall, anyone looking for a cost effective decent performer can go ahead with this laptop from HP if you can compromise on few areas. This laptop is a budget friendly laptop with decent performance that falls under sub 400$ category. The display consists of a 15.6 inch HD display with a screen resolution of 1366*768 which is quite basic in all the laptops under this price range. The IPS wide viewing angles and also touchscreen facility is not present in this laptop which is not surprising when you are paying just around 400$. The backlight is an energy efficient LED type. The laptop weighs around 4.85 lbs and has a thickness of 0.9”. Talking about the performance, this laptop houses an AMD A12 -9720P Quad core processor which is a mid range CPU. This CPU consists of the Radeon R7 chipset GPU which enables entry level gaming for casual gamers. The CPU runs at a clock frequency of 2.70 GHz. It also has 8 Gigabytes of DDR4 Ram which allows the user to perform most of the day to day multitasking. 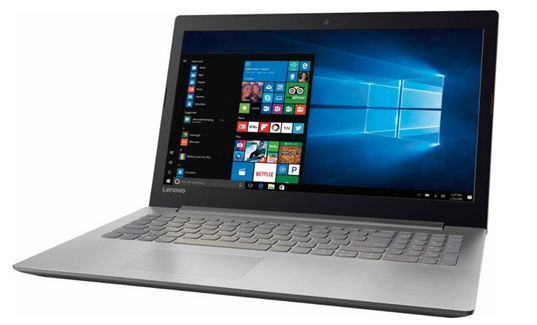 The Lenovo IdeaPad 320-15ABR 80XS0024US has an optical DVD multi-writer. The 802.11 ac WiFi technology provides internet speeds of up to 3 times when compared with other laptops without this feature. It also has a 4 in 1 memory card reader, 1 USB type-C port, 2 USB 3.0 ports and Bluetooth 4.1. The addition of USB type-C port makes this laptop stand out from the rest of the budget laptops in this price range. It comes with pre-installed Windows 10 OS and also has a hard disk capacity of 1TB which lets you store most of your High definition videos and so on. The battery is a 2 cell Lithium-ion battery. Lenovo promises a capacity of 5 hours duration for this laptop but unfortunately, it does not live up to the claim. For laptop users who are worried about battery capacity, then this laptop is a straightaway no. The reason being that it lasts only up to 3 hours maximum after a full charge which is quite disappointing. Neglecting that aspect, this laptop from Lenovo has a beautiful display in this price segment, a sturdy feel and a decent overall processor with a solid GPU. To sum up, we can truly say that the Lenovo IdeaPad 320-15ABR 80XS0024US is a fast runner but with limited stamina! When it comes to buying a 2-in-1 laptops most customers come with their own set of expectations. After all such customers are fence sitters who can’t really pick between a laptop and a tablet. It is a tricky market where many PC manufacturers haven’t had happy experiences. 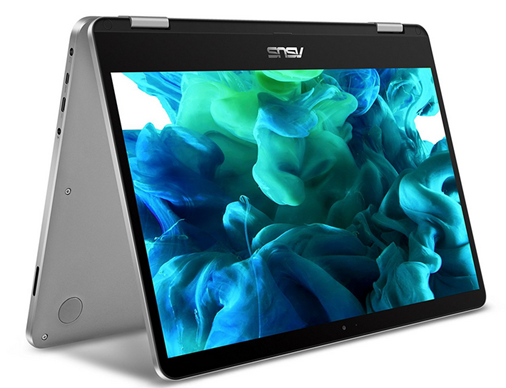 Asus is one rare company that had many successes in the 2-in-1 market and its latest ASUS VivoBook Flip 14 TP401NA promises to impress the customers. To talk about design the VivoBook Flip 14 sports a sleek design neatly encapsulated in a 19.2 mm Aluminum casing. At 1.6 kg it is surely the thing you would like to carry everywhere. Talking about display it features 1080p Full HD display with an incredible screen to body ratio just like smartphones made possible by NanoEdge technology. The colours are bright and vibrant and the screen reproduces wide spectrum of hues. You get four distinct viewing modes – laptops, tablet, tent and stand. In terms of storage you have the option to choose between 64 GB and 128 GB EMMC. Most users would opt for the 128 GB EMMC which makes it quite a dream device to play around with. Connectivity wise this is surely the premium 2-in-1 you would like to own. It comes with 2 USB 2.0, a USB 3.0 and USB Type C port apart from the standard HDMI, Audio and Card Reader. Moving on to wireless connectivity and you get Bluetooth 4.1 which is the latest standard and dual-band 802.11ac Wi-Fi. This new generation of Wi-Fi technology allows you to enjoy 6x speeds compared to previous generation. Turning to the all-important parameter performance – VivoBook Flip 14 is as powerful a 2-in-1 that one could expect. Under the hood sits an Intel Core m3-7Y30 processor with clock speed of 2.6 GHz and 4MB Cache. It comes with 4GB DDR4 RAM which makes it a mean machine to play with when combined with Windows 10 Home. Run the mosts demanding apps or try your hand in some high performance games and it will impress you. Are there any downsides? Well there are a few, if you opt for the 4GB version you will have to bear a sluggish laptop with Windows 10 taking up lots of space. In terms of battery too Asus could have packed in little more juice as it last less than 6 hours which isn’t something 2-in-1 buyers would be too happy about. The keyboard too shows signs of flex problem something the manufacturer should have taken care of. To sum up, ASUS VivoBook Flip 14 is an all-powerful 2-in-1 that is perfect for work and leisure activities. It is impressive on the specs side and matches the best laptops in the market and yet is a nice notebook to play around with. in terms of looks, display and performance Asus VivoBook Flip 14 is a clear winner. While it does have some downsides considering other products it is up against, it is value for money. 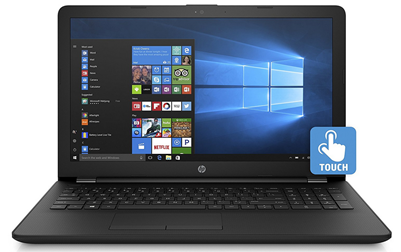 This laptop from HP is a 15.6 inch touchscreen with Windows 10 OS and is in the range of affordable laptops. Just to brief things up, it features an Intel Pentium N3170 processor which is an entry level quad core processor. It houses 4 gigabytes of DDR3L-1600 Memory and 500 GB of hard disk capacity. A multi DVD writer and an Intel HD Graphics 620 are the other features of HP 15-BS020WM. Starting off with the display, it features an HD resolution of 1366*768. It has a TN display panel and the drawback here is that IPS class wide viewing angles is not available. Except for the touch screen functionality, the display aspect is not quite impressive. The laptop offers a 10 Finger Multi touch support. There is an HDMI port, one USB 3.0 port, 2 USB 2.0 port and a Multi-Format SD slot. When it comes to performance, it’s just mediocre. Even though the chipset is a quad core, the Celeron processor N3170 is a major let down for heavier tasks. If you are just into normal day to day activities, then the processor shouldn’t give you much trouble but you would have been better off with even a basic i3. 4 GB of RAM should suffice to carry out multitasking and the 500 GB capacity would let you store most of your files and some downloaded movies as well. The keyboard is not backlit and the laptop has a plastic like chassis. The battery capacity claimed by the manufacturer is of 7 hours duration. It also has an audio mic/headphone port and stereo speakers. 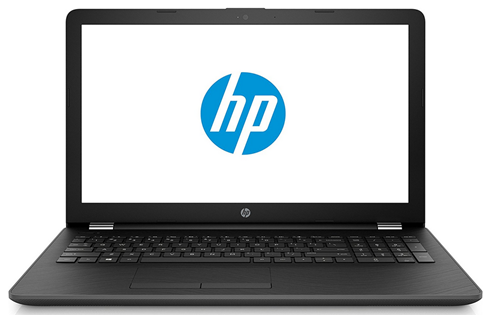 The HP 15-bs020WM is a solid performer for the average laptop users. The main highlight is the touchscreen feature at this price point which is great. But it does compromise on other sections of the laptop which can affect users who are looking beyond just a touchscreen. If you could compromise on the touchscreen and is tight on budget, you can still opt for other options. Otherwise, this machine is just another spiced up average horse! The Aspire E5, although not faster that the HP device we just reviewed, is much more comfortably priced at $350 for a 1TB HDD and $381 for a 1TB HDD and a 128GB SSD variant. This is very fortunate as it manages to stay below the $400 price point leaving a little room for RAM or storage upgrade. Keep in mind, this also has an M.2 slot in it. So if you want to see how big of a difference faster storage alone can offer, without an insane i7 processor, you may want to experiment with this laptop. Trust us, you will not regret the upgrade at all. The CPU inside is a 2-cores/4-threads i3-7100U, which is power efficient at the expense of being slower at 2.4GHz without any turbo boost available. This is not at all meant for gaming or heavy workloads but will give you good battery life. We all know at this point, that the actual bottleneck is in the HDD and getting an SSD with the 7100U is much better than getting an HDD with 7200U. For memory we have 4GB of DDR4 SDRAM, which will get congested soon enough making multitasking a real nightmare. This is why we recommended a RAM upgrade in the beginning. Also worth mentioning is the fact that this has an Intel HD 620 as an integrated graphics solution and no dedicated GPU, obviously. However, the display is a respectable 1920 by 1080 TN panel display with an antiglare coating. Audio solution is sufficiently loud but the sound does get broken and unclear at higher frequencies. Needless to say, viewing angles are bad as compared to the IPS panels but for a laptop of this size you’d almost always be staring at it directly. In terms of build quality, it has a decent brushed metallic finish around the keyboard and an obsidian black lid, giving it a premium look and feel. The keyboard is backlit and the touchpad is just good enough to get the job done. In terms of connectivity, we have 802.11 ac, Bluetooth 4.1 an HDMI connection, 2 USB 3.0 ports, 1 USB 3.1 (Type C) and a USB 2.0. Again, it is good to see Kaby Lake’s high speed peripheral connectivity being used, even on budget laptops. The laptop itself is quite hefty at around 5.23lbs (2.4kg), it does have that vestigial optical drive to add to its weight. The battery life is around 5 to 6 hours of casual use which is something quite useful if you travel a lot and want to be productive in your hours of commute. This laptop effectively combines aesthetics with performance. The display is nothing but excellent coupled with a very attractive design. If you are living in a place where the power supply is nothing to be desired, you have nothing to worry about with this system because it has a very enduring battery life. The system is 0.51” tick and 2.38lbs in weight with 2 GHz speed OP1 Processor. The laptop Storage Capacity is 32GB with 4GB RAM. With a 360 degree rotation display, you have a wonder of a system at your disposal when you have the Samsung Chromebook. This PC is not your average Chromebook even though it is an absolutely excellent Chromebook at that. 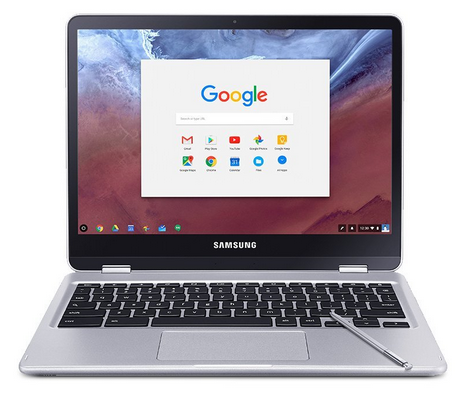 It will be hard for you to find any other Chromebook as attractive as the Samsung Chromebook plus convertible Touch Laptop as it is just classic and stylish with a brilliant 2400 by 1600 screen. Another feature that really stands out is the embedded stylus. Being a laptop that does a lot of activities on cloud, the Samsung Chromebook does not really offer much when it comes to ports. It has a headphone jack on the left side of the device as well as a MicroSD Multi-media Card Reader. It has various viewing angles on offer and this is surprising especially because of the glossy finish of the screen. The only issue that comes with that however is the fact that the laptop can really be sensitive to light and this will be obvious when you try to utilize the system in tablet mode. The PC obviously has a lot of pleasant and exciting features as highlighted above, however, it can be a little frustrating sometimes as a result of the weak response of the keyboard as well as the fact that it has a somewhat limited onboard memory. All things considered, Acer Aspire E5 turns out to be not only the best overall performer (with an SSD), but also the best bang for your buck. 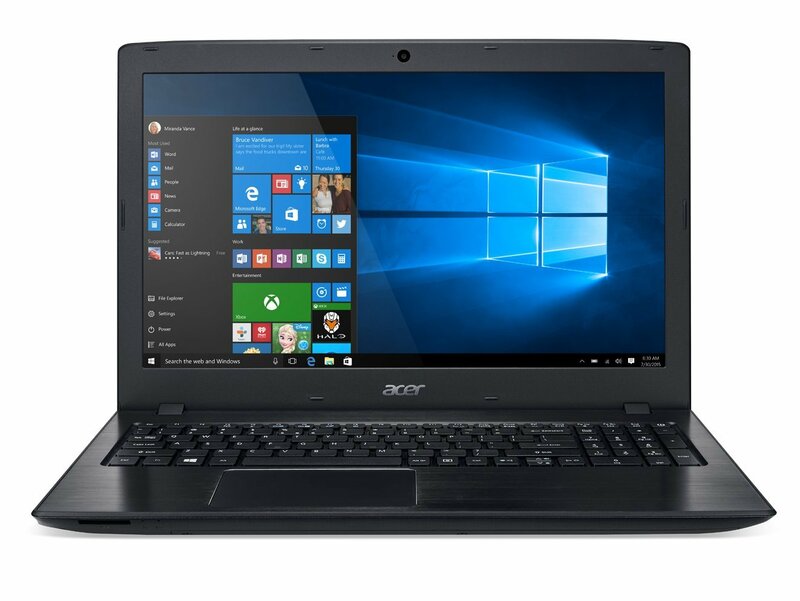 With reasonably powerful CPU and decent peripheral connectivity this does exactly what a $400 laptop should be able to do: Provide a smooth and responsive computing experience for light workloads with longer battery life. For travelling bloggers, people who work with Microsoft Office a lot, or just want to binge-watch an entire season in a night, getting a 1TB slow HDD is not something we’d recommend. Adding a faster SSD and installing your operating system on it is the first thing you should do after getting any of the laptop. Also it is recommended that the applications you use the most like Microsoft Office or Visual Studio should be installed on the SSD which would significantly reduce the load time.